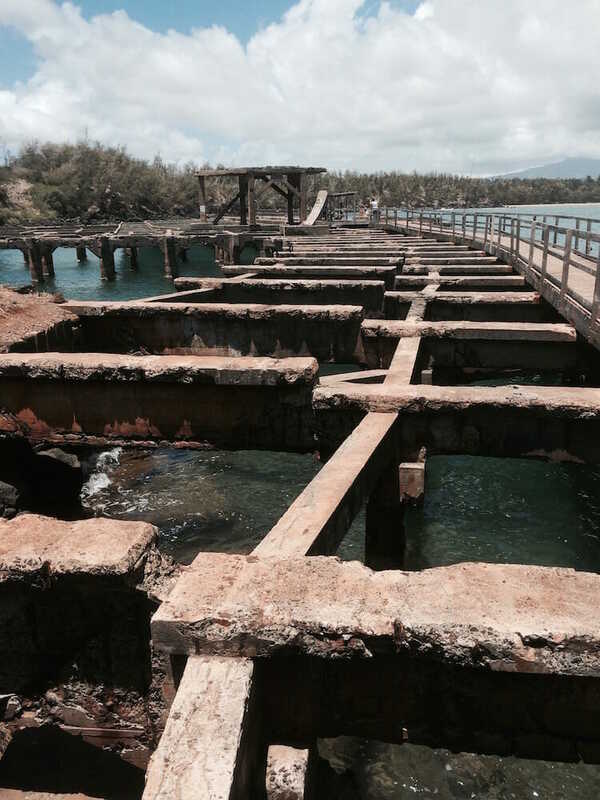 One of the last things we did on Kauai was visit Ahukini Landing. Typically, Ahukini Landing is glossed over in the guidebooks. And, even though it’s only a couple of miles from our condo, an old fishing pier that had been removed never quite seemed interesting enough to warrant a visit. At least, not until we were talking to a shopkeeper in Hanapepe. He told us that we “must go.” A day or so later, we visited Ahukini Landing—and, wow. Let’s just say that the aloha spirit is alive and well at Ahukini thanks to something in the air. We discovered this when we took a stroll along the pier’s old infrastructure. On the old pier, we came across a family who had lines in the water, but seemed very unconcerned about them. More serious fishermen go to Ahukini Landing too, but they like it out on the rocks. Shipping traffic was primarily driven by Makee mill at Kealia. That mill was about ten miles north. But, traffic declined starting in 1930 when Nawiliwili Harbor was completed. When the mill was closed in 1934, traffic fell further. The pier was dismantled in 1978, but has been used as a location setting in movies such as Donovan’s Reef, Pagan Love Song; 6 Days, 7 Nights; To End All Wars and Voodoo Island. By the way, I’m always on the lookout for good Hawaii photos. Let me know if you have some to share and we’ll talk about featuring your shots on Friday Fotos! Hint: you can manually advance through the slides by placing your mouse over the slideshow and clicking the pause button, then use the forward/back buttons to navigate. Kalikala, thank you for telling me about your family. Some of the stories about what the plantation workers and early immigrants went through are amazing stories of fortitude and determination. I sincerely hope those promises worked out for the better. Mahalo for finding me and commenting. Very nice, Now i want to go to the beach. I know, Barbara, it’s just so inviting! ALWAY ENJOY THE PICTURES AND FOUND TODAYS VERY RELAXING FOR ME ON A HARD DAY. I’m glad I could provide a little R&R—at least for a little bit!